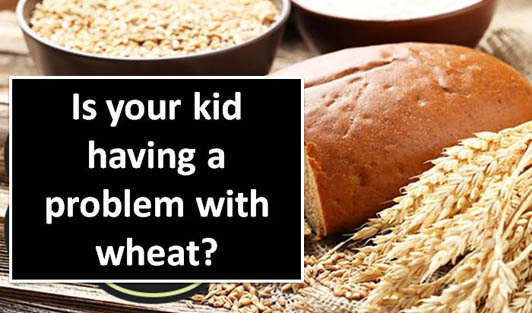 Is your kid having a problem with wheat? Gluten is the elastic, rubbery protein present in wheat, rye, barley and to a lesser degree in oats. It binds the dough in foods such as bread and other baked goods. It contributes to spongy consistency. Rice and maize do not contain gluten. Gluten is only one protein found in wheat, rye and barley. These foods, like all other foods, contain a number of discreet proteins that all can result in adverse reactions, including allergies. Common symptoms of a wheat allergy include eczema (atopic dermatitis), hives (urticaria), asthma, "Hay fever" (allergic rhinitis), angioedema(tissue swelling due to fluid leakage from blood vessels), abdominal cramps, nausea, and vomiting. Rarer symptoms include anaphylactic shock, arthritis, bloated stomach, chest pains, depression or mood swings, diarrhea, dizziness, headache, joint and muscle aches and pains (may be associated with progressive arthritis), palpitations, psoriasis, irritable bowel syndrome (IBS), swollen throat or tongue, tiredness and lethargy, and unexplained cough. Reactions may become more severe with repeated exposure. The diagnosis may be easy if a person has the same reaction repeatedly after eating wheat-containing food. More often the diagnosis is difficult because wheat is usually consumed with other food. Diagnosis usually entails clinical evaluation (medical history, family history, food history) supported by appropriate laboratory tests. Gluten sensitive may need to avoid related cereals, rye and barley, which have similar glutinous proteins. And doctor should be consulted. Gluten-free oats, wheat, rye or barley is available in food mart and may be a useful source of cereal fiber. Some wheat allergies allow the use of rye bread as a substitute. Rice flour is a commonly used alternative for those allergic to wheat. Wheat-free millet flour, flaxseed, boiled corn can also be used. Gluten allergy can stay for life time and for some it may go away as they grow. So don't panic, follow doctor's instructions and meet a dietitian to get the healthy diet for your child.